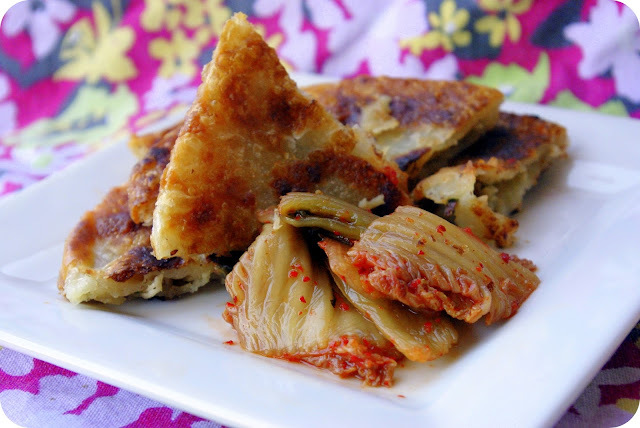 Jeon (also spelled jun or chon), buchimgae, jijimgae, or jijim refer to many pancake-like dishes in Korean cuisine. It has been also called jeonyueo or jeonyuhwa, especially in Korean royal court cuisine. Sometimes, jeonya (hangul: 저냐) is used as an abbreviated term for the two.Jeon is made with various ingredients such as sliced meats, poultry, seafood, and vegetables depending on the style and mixed with flour batter or coated with egg batter and then pan-fried with oil. My Mom may be a bit shocked when she sees that i'm about to write about pancakes. And not only just write about them, but declare my love for them. When I was little, I loathed pancakes, or anything smothered in maple syrup for that matter. Breakfast type food at dinner time was bad enough, but pancakes? These were by far the worst offense. And I certainly don't mean to imply that I actually liked them for breakfast, but pancakes, at supper, reduced me to tears, and for lack of a better word, anger. There were times that I thought about how far they would fly if I were to throw them. That, and how much trouble I might actually get into if I were to do it. I never actually did come anywhere near throwing them, but I did fantasize. The thought of pouring sugary goo all over what was supposed my supper made me sick to my stomach, and I would rather starve than be forced to eat this "meal". I didn't have much a sweet tooth to begin with, and to me, pancakes fell into the dessert category. I could barely classify them as real food. And then, one day, far into the future, I met these. Yes, these are pancakes, but there need be no fun ruining, gag-inducing syrup involved. In fact, they aren't sweet at all! They're basically a skillet fried batter, with savory ingredients that I can actually enjoy. And topped with a little bit of kimchi and sriracha, I actually look forward to them. I like daikon radish, carrots, zucchini and scallion, and sometimes even shrimp! You can get creative with these, and the amount that you decide to put in is really up to you. Once the veggies are grated though, try to squeeze out a little bit of the moisture with a paper towel before using them. You can use bigger chunks or strips, but they might need some pre-cooking if you want them to be tender. Mix all the ingredients together except the veggies until the consistency is even and without lumps, then throw in the vegetables. Heat a skillet over medium heat and coat with a thin layer of oil. Pour the batter in and make about a 5 inch pancake. You can make larger, but they might get hard to flip/keep together. These will also pour slightly runnier than breakfast pancakes. Cook for about 3 or 4 minutes, until the bottom is golden brown, then flip it over and cook for another 1-2 minutes. Cut into wedges, and serve with Kimchi or a spicy dipping sauce.